In the 1973 sci-fi/horror flick Soylent Green, fresh fruits are an unheard-of luxury, and residents of an overcrowded and polluted New York (all 40 million of them) subsist on tasteless “Soylent” wafers, having long ago exhausted the country’s farmland. The newest Soylent product offering, Soylent Green, purports to be a blend of oceanic plankton and other “non-farm” ingredients. A labyrithine murder investigation (and one of Charleton Heston’s most famous film quotes) eventually reveals the horrifying truth: “Soylent Green is people!” The once-great city’s population is seen by the cynical corporation as nothing more than a source of protein and cash. In a strikingly similar way, the mega-corporation Facebook has converted its hundreds of millions of users into its product. Have you noticed that the advertisements you see on Facebook are curiously similar to the interests you have listed on your profile? While Facebook generates plenty of revenue from games like CityVille and its various spinoffs, the vast majority of its profits come from advertising, and anything you ever post, like or share is fair game for advertisers to know. In the first quarter of 2012 alone, Facebook sold more than $800 million worth of advertising space. Of greater concern is protecting yourself from other users. About 4.8 million Facebook users at any given time announce to the world exactly what time they will be at which locations. What’s more frightening is that the updates of those with no privacy settings, which accounts for about 17 percent of users, can be tracked by anyone on the internet. Don’t think it’s true? 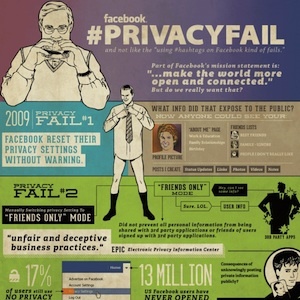 Visit weknowwhatyouredoing.com for an eye-opening look at the weakness of Facebook’s privacy policies. Facebook’s numerous privacy failures reveal the chilling truth: on this, the largest of all social networking sites, you aren’t the user…you’re the product.